Researchers may have made the first steps in developing an effective treatment for the common and often debilitating hearing problem called tinnitus. 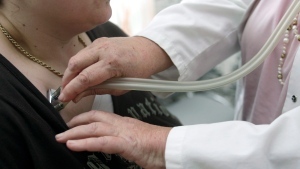 As many as 15 per cent of Canadians suffer from chronic tinnitus, a condition marked by a persistent perception of ringing or buzzing in the ears. The phantom ringing often impairs concentration and can sound loud enough to make even the simplest of day-to-day activities difficult. There is no cure for chronic tinnitus and the only way to manage it is with counselling to lessen a sufferer’s awareness of the sounds, and “sound therapy,” which uses other, louder sounds to drown out the tinnitus . 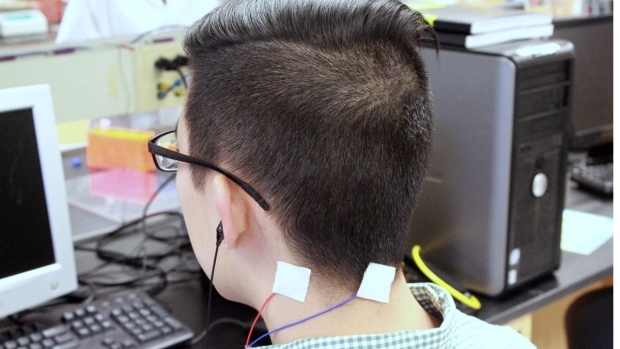 But a group of U.S. and Canadian researchers has been testing whether a device that delivers audio and sensory stimulation can address the problem at the source. The device, developed and patented at the University of Michigan, delivers brief sounds through headphones as well as mild electrical pulses to the neck or cheek. A study published this week in the journal Science Translational Medicine found the device helped to significantly reduce the perceived volume, or loudness, of the tinnitus ringing in more than half the patients who tried it. In two patients, it helped eliminate symptoms altogether. Dr. Larry Roberts, a researcher at the Human Neural Plasticity Lab at McMaster University in Hamilton, Ont. who helped develop the device, explains that the scientific understanding of tinnitus has evolved significantly in recent years. Tinnitus was once assumed to be a problem with the inner ear, but recent research has found it involves a part of the brain called the cochlear nucleus. Neurons in that structure, which is located on the brain stem between the ears, normally receive signals from the ear when sounds are heard. But when those neurons, called fusiform cells, become badly damaged -- typically by aging or exposure to a loud sound -- they stop receiving input from the ear and begin to act abnormally. “They sort of start talking among themselves,” Roberts explained to CTVNews.ca by phone. It’s this continuous “talking” that generates the buzzing and ringing that’s typical of tinnitus. Other recent research has found that the cochlear nucleus receives input not just from the ear, but also from touch-sensitive cells in the neck, throat and face, called somatosensory fibres. In fact, some people with tinnitus find that if they clench their jaw, or press on their face or neck, they can temporarily stop the sounds. So Roberts and a team working at the University of Michigan led by Dr. Susan E. Shore, recruited a group of sufferers of this type of tinnitus and tested their device on them. Roberts explained that by delivering sound tones through headphones as well as the mild electrical pulses to the neck, the device can target the damaged, unruly fusiform cells and steer them back into normal activity. “If you present auditory and somatosensory inputs simultaneously but separated by a brief interval – of just five milliseconds -- you can suppress the activity of the fusiform cells,” he said. Twenty patients used the device at home and their results were compared with patients who received devices that only offered the sound tones, not the electrical pulses. Eleven of the participants said the device helped reduce the volume of their tinnitus, while two said the treatment completely eliminated the ringing. While two out of 20 patients may not seem significant, Roberts said “it’s quite unusual in the literature to find any patient who becomes tinnitus-free” using the treatments that are currently available. “That’s actually quite a lot, since the average sound level of tinnitus is in the vicinity of 20 decibels,” Roberts said. The study had the participants use the device for 30 minutes a day for four weeks. Once the treatments ended, though, the patients’ tinnitus returned within a week, on average. Roberts explained the treatment is not a cure; once fusiform cells go back to receiving improper input from the ear, they begin “talking to each other” again and revert to tinnitus activity. The next phase of study will investigate whether longer treatment sessions can suppress the tinnitus for longer, Roberts said. Until researchers find a way of repairing damaged auditory nerves and restoring proper input from the ear to the cochlear nucleus, there will be no way to permanently eliminate tinnitus, Roberts said. “There are a lot of labs working on that problem. The problem is not in hand though, and it’s some years away,” he said. Until then, this device might one day offer some relief, he said.